IF YOU ARE LOOKING FOR CHALLENGE #1 FOR SKETCHES: CREATIVELY YOURS, PLEASE SCROLL DOWN TO THE NEXT POST. Here we are again with a blog hop to see how the Master Forgers have interpreted our inspiration kit. You should have arrived here from Lisa J's blog or if you've just stumbled in, go to the Counterfeit Kit Challenge blog to start from the very beginning and work your way through all of the inspiration. Let's take a look at our inspiration kit, "Soda Shoppe" by Noel Mignon. 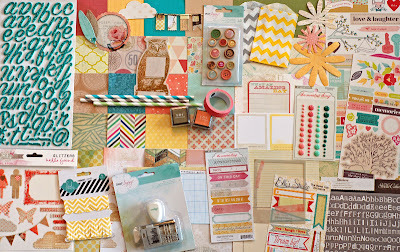 I love the variety of papers and embellishments and the pop of turquoise and yellow. There's something about it that feels very fun and youthful. It reminds me of my days as a girl scout at Camp Hoover in the remote northwest corner of New Jersey. Each Fall, we would take a weekend encampment and our trip would end with a walk to the local town's general store. Inside, there was a classic, old-fashioned penny candy counter with a little old lady who would patiently listen to all of our confectionery requests and fill brown paper bags with candy dots, Swedish fish, Pixie Sticks and Tootsie Rolls. It was always so exciting to make these purchases and even more exciting to eat all of the sweets on our walk back to camp. Now, just like in the old days, each item is one for a penny. Count how much money you have and let's take a closer look so you can make your choices. Mr. Owl seems like he would fit in just right at Camp Hoover and with the Girl Scouts. Paper straws reminiscent of Pixie Sticks and washi in a variety of candy colors will dress up a layout nicely. Yellow distress ink, a chevron mask and some little white bags were an easy counterfeit of the ones in the inspiration kit and a perfect place to store your candy treats. Ka-ching! That will be 12 cents, please. Epoxy "candy" dots resemble the ones in the inspiration kit. Close enough for me! So many choices! So many sweet layouts to come! Next stop will be Milissa. Thanks for taking a stroll down memory candy lane with me! Be sure to check back throughout the month to see how my Penny Candy Shop is transformed into scrapbooking memories. For the most part, scrapbooking is so much fun, but there are times when it can be overwhelming. I often get stuck on where to start. That's when a sketch is so helpful to get the creative juices flowing. Here's the March layout sketch from Sketches: Creatively Yours by Ali MacDonald. Once I decided on that flair, the story came together easily. Stinky hockey gear! Ewwww! And of course, I know that phrase is "wreak havoc", but "reek" just fit so perfectly. I love coming up with clever titles! I had fun making my green Mister Huey spray mist act as the skunk's spray! Luckily, it has no scent at all. My son has a good sense of humor, so he didn't mind that I officially called him stinky! I hope this sketch inspires you as much as it did me. I can see using it again and again to showcase multiple pictures and one big "wowzer" of an embellishment! TWO BLOG POSTS IN ONE DAY! A NEW RECORD FOR ME! SCROLL DOWN TO THE NEXT POST TO SEE WHERE I'M GUEST DESIGNING IN MARCH. 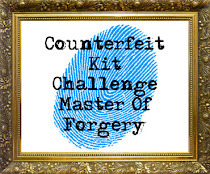 Welcome to our Special Edition blog hop for Counterfeit Kit Challenge. The purpose of this hop is for everyone (design team members and fans of CKC) to get to know each other better. Sure, you can click on my little bio on the side, but here's a chance to get to know the little ins and outs about Lynnette. In order to get us started, Rebecca (one of our CKC organizers) provided us with these great journaling sheets courtesy of Christie Zimmer from her blog, graceisoverrated.com. We were to fill out the sheets and be inspired by our responses to create something...anything...to help you all get to know us better. Wow! That was so much fun! Thanks for taking the time to get to know me a bit better. Be sure to hop on over to all of our participating design team members to get the inside scoop on them. The hopping "road map" is listed below. I am so thrilled to be spotlighted as the March guest designer over at Sketches: Creatively Yours, a fun, free and inspirational sketch blog. I believe it was May 2010 when I met Ali MacDonald (team leader of S: CY) during Lain Ehmann's Layout A Day challenge. She started a thread on the discussion board offering crock pot recipes to save time for scrapping and my ears perked up right away. I've since become a member of her facebook resource, "Ali's Recipes to Share" and many of the recipes from there have become mainstays in our menu rotation. As for a scrapper, I've always admired Ali's work. She shares so many beautiful photographs of her family and through her journaling it is evident how much she is devoted to them. She always chooses perfect embellishments and always adds just the right amount of distressing or inking to set her elements apart. In addition, Ali is such a supportive and encouraging friend. She is always active in commenting providing meaningful feedback. I only wish Close to My Heart would allow her to sell internationally as I would be a faithful customer for sure! If you are looking for some inspiration and an encouraging pat on the back, check out Sketches: Creatively Yours. Whether your style is clean and simple or more elaborate and decorated, the sketches are versatile enough to meet your needs. 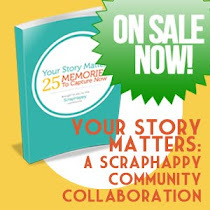 I am excited to add this resource to my scrapbooking repetoire. While one would usually expect to see speech bubbles coming from people, I decided to have my speech bubble for the CKC speech bubble challenge come from an inanimate object. Shown in the layout below, my treadmill is almost taunting me. This layout was completed as part of the Layout a Day Challenge. The prompt was to think about goals. Maybe it's that the treadmill is in my craft room and scrapping always trumps exercise! I am serious about moving more so I do intend on keeping to this goal. So.....I guess I gotta go walk on the treadmill (sigh). February may be my favorite month of the year to scrap. Long, cold winter days lend themselves to inside time for creating. The holidays are over and there's a lull in activity. I quite enjoy the calmness. 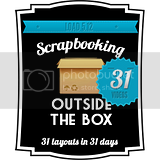 February is also the month for Lain Ehmann's Layout A Day scrapbook challenge. If you are not familiar with this online challenge, it is a month long pledge to create a layout each and every day of the month. Lain provides thought-provoking prompts that challenge you to step outside your comfort zone. So far this month, I've created 3 layouts (yes, I'm right on track). While I will utilize my February Counterfeit Kit, "Prep School", sometimes I do have to refer back to my general stash for papers and embellies that really suit the page. The first LOAD challenge had us leaving out all words on the page, which is kind of ironic since the first CKC challenge of the month had us only journaling and omitting photos. Talk about shifting gears! Choosing poignant photos and embellishments to tell the story was key here. Day 2 had us scrapping a perfect day. Nothing better than a cup of joe with my bestie, Tara. And finally a layout with my CKC kit! A silly play on words for the title highlighting an under appreciated, yet very useful part of my daily life - my crockpots. Choosing from my assortment of goodies made this layout come together in a snap. So, that's what has been happening at my scrap table lately. Thanks for stopping by. I had considered creating an 8.5x11 page to cut down on my ground to cover, but the October Afternoon chipboard pieces and some DCWV polaroid pics (thanks, Leslie) came to the rescue to help support the theme of my page. And what luck that the film strip had exactly 6 spaces to fit the word "camera". Love when it all works out like that! I placed it front and center, as you might do with a photo, and highlighted it with some strips of patterned paper. I'm so glad I have this story down as my camera is such an important tool in my memory keeping and I am so grateful to my grandparents to be able to own it. I hope they are watching down and smiling as I record our family's stories. There, that's better. The black and white chevron washi really livens up the whole layout and brings out the black in the camera. Sometimes you just have to step back from your layout a bit and get some perspective. I wasn't unhappy before, but I am much happier now! 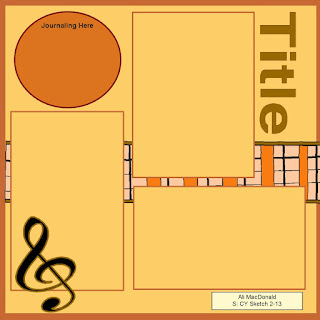 So, don't be intimidated by a journaling-rich layout. Find some embellishments that fit your topic and let them and your story take center stage.